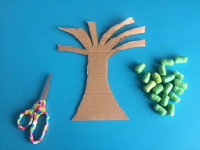 Explore trees and the role they play in the environment with this project. 1. Gather your material. 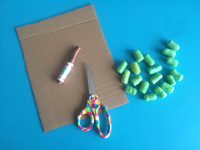 You will need cardboard, scissors, a brown marker, and several green Magic Nuudles (available educatall.com online store). You will also need a moist facecloth (not shown) for this project. 2. 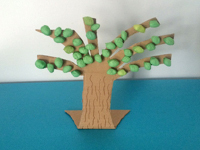 Cut a simple tree shape out of the cardboard. 3. Cut each Magic Nuudle in half. Gently pinch the ends of each piece to represent leaves. Press them on the moist facecloth and then on the tree branches. 4. Use the brown marker to draw squiggly lines on the tree trunk and represent bark. Fold the bottom of the tree back so it will stand up. 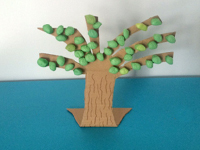 Display children's trees on a shelf or in a special corner, arranging them to represent a forest. 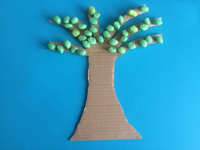 Take advantage of this project to discuss trees with your group.